Cuphea cyanea is a great plant for the perennial garden. The Black Eyed Cuphea puts on a show from mid Spring until frost. 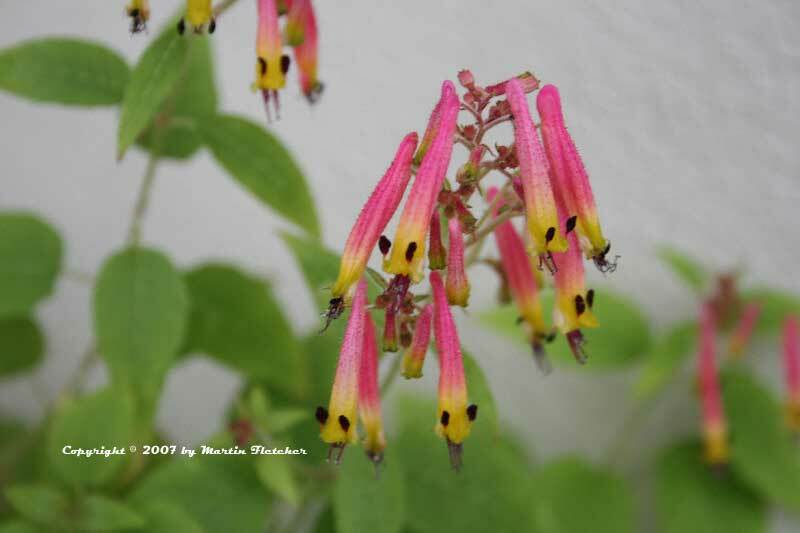 Cuphea cyanea will produce a profusion of pink flowers in full sun or in light shade. The Black Eyed Cuphea requires little water, but performs best with at least semi regular irrigation and decent drainage. The stems are brittle so keeping plants set back from high traffic areas is a must. Cuphea cyanea will grow to 18" and will withstand Winter temperatures into the mid 20°s F.
Flowers and foliage of Cuphea cyanea the Black Eyed Cuphea. High resolution photos are part of our garden image collection.